Mark Wales, an Elgin County farmer, serves on the Ontario Federation of Agriculture (OFA) Board of Directors as the Zone 4 Director representing the counties of Elgin and Oxford. He previously served as OFA President for three years from 2011-2014. He held the position of Vice President from 2008-2011 and served as the fourth Executive Member in 2007. Wales has been an OFA board member since 1994. He graduated from the University of Guelph in 1976 with a Bachelor of Science in Agriculture, and has been involved in diversified farming in the horticulture sector and tobacco ever since. He is a graduate of Class 6 of the Advanced Agricultural Leadership Program, and participated in the 2004 Nuffield Canada Scholarship program where he presented a project on “Alternative Crops to Replace Tobacco in Ontario”. Wales’ work with agricultural organizations began in the late 1980s when he delivered land stewardship workshops. 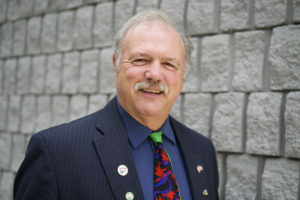 His accomplishments include being elected Chair of the Elgin County Peer Review Committee for the Environmental Farm Plan, Chair of the Elgin Stewardship Council, President of the Garlic Growers’ Association of Ontario, President of the Elgin County Federation of Agriculture, and Chair of the Safety Nets Committee of the Ontario Fruit and Vegetable Growers Association. He is a Director-at-Large of the Elgin County Federation of Agriculture and has been involved with the local federation for 20 years. This work led to his involvement with the OFA where he served as Chair of the Farm Finance, Trade and Taxation Committee. Wales serves as an agricultural representative on the Lake Erie Region Source Water Protection Committee, and is the only farmer on the Lake Simcoe Co-ordinating Committee. He is also currently the Vice-Chair of the Canadian Agricultural Human Resource Sector Council.